Die ganze Geschichte der Band plus die Nachfolger. Rockmusik aus Österreich aus den 70er und 80er Jahren des vorigen Jahrhundert. Und - seit 2008 - wieder neu als Mud Shurko. This is the official website of the progressive psychedelic rock band Ixthuluh, created by Ernst Matscheko, erstwhile drummer and housemaster, today MudShurko. IXTHULUH was psychedelic krautrock from austria. Started with jazzrock we soon changed in an own direction, called "near sibiria". Founded 1975 the group was named Ixthuluh since spring 1976. At the beginning enhanced by many bands later collected under the progressive label, we started early looking for the own sound far-off music business. The group bought an old farmhouse in 1977 and changed from the band Ixthuluh to the Kollektiv Ixthuluh. 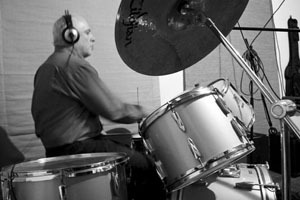 Since this time website owner Ernst Matscheko played drums for the group, as well as other noisy things. Totally five disks document the work history. Today Ixthuluh would be characterized as jam-band. The group disbanded at the end of 1981. Successor The MUB did it one step beyond from 1982 to 1985. Alle Musik von Ixthuluh, The Mub und Mud Shurko ist lizenziert unter einer Creative Commons Namensnennung - Nicht-kommerziell - Weitergabe unter gleichen Bedingungen 4.0 International Lizenz.